Beech, European beech, Common beech,Green Beech. Hedging quality. Hedging quality Beech, European beech, Common beech, Green Beech. The Fagus sylvatica green beech is a very suitable hedge plant with smooth, grey bark and shiny dark green foliage which will turn yellow in the autumn. Green beech will bear yellow male flowers and green clusters of female flowers, they are followed by edible nuts that will also attract wildlife. Green beech tolerates range of light. 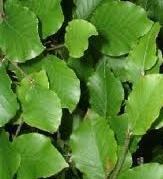 Fagus is very suitable for hedges. Pot grown and cell grown fagus available all year and bare root fagus in October-April time.